President John Kufuor escaped unhurt when his convoy was involved in an accident on Wednesday while he was on his way to the Castle. The accident occurred on the main road between the Kotoka International Airport and the 37 Military Hospital. The president's vehicle was crossed - some eyewitnesses claim his vehicle was rammed into - by a red Mercedes coming from the opposite direction, at a major intersection on the Airport road. No official version of how the accident happened has yet been released, however the Presidential Press Secretary Andrew Awuni said: "The picture is not very clear about the accident, It's a bit strange for the car to run into his car directly." The vehicle, Kufuor was in, rolled over several times. According to an eyewitness: "The car finally rested on the sidewalk and the people around helped his security men to pull him out. The president came out holding his head"
Later in the day, the Presidential Press Secretary said the president appeared to be unhurt and is back at Castle but was undergoing medical tests. Some members of the president's entourage, who were seriously injured, have been moved to the 37 military hospital for medical attention. He said preliminary investigations had begun to ascertain the circumstances of the accident to take precautionary measures. The security source said that "a suspect" had been detained pending further investigations. 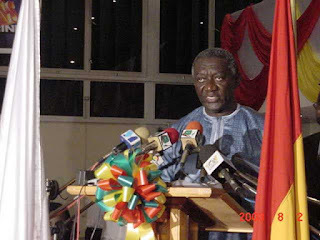 Text Message to GHP Newsroom from "eyewitness"
Kufuor was hurt. they are hiding smthg.. There are however conflicting reports on the accident. While the Information Minister Oboshie Sai-Cofie told Joy News that the President was unhurt and safe, eye witnesses Joy News spoke to said, the President�s car which was knocked from the left side was came out of his car holding his head and was lifted by onlookers to an unknown destination.